Zurich Bank closed on 31st March 2003. For alternative accounts, see our Finance page. In an email sent to customers on 5th September 2002, Zurich Bank plc stated that their online banking service will cease in the Spring of 2003, following their undertaking of "a global strategic review of its businesses and altered its strategy - deciding to refocus its energies and its capital on its core insurance activities, to the benefit of the majority of its customers, staff and shareholders". This follows publication of their half-year results. Compensation update: Customers will be offered a one-off goodwill payment as compensation for the closure. This has been announced as 5% of cleared net balances on 4th September, or £200 - whichever is greater. 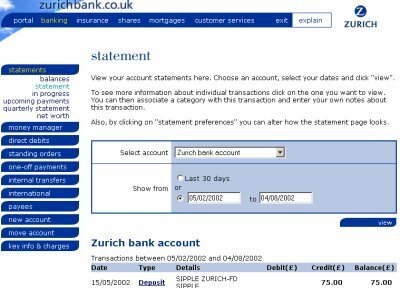 I received my final payment electronically transferred to my first direct account on 18th December 2002, followed up by a letter received on the 20th December confirming account closure, and enclosing a statement. Credit included the goodwill payment as expected. This followed a letter from Zurich dated 19th November regarding closure of the account - The instructions were to return the destroyed Zurich bank card, to destroy cheques and paying-in books, and supply details of an alternative bank account. This would allow the account to be closed, and the outstanding balance, plus the one-off compensation fee, to be transferred to the specified alternative account. The letter states this may take up to a month. It was still possible to use existing accounts until around Spring 2003. The number 0870 9042409 is available to customers who require more details of the closure. Selling points Access to your money at over 35,000 Link cash machines. Up to 6 Sub accounts to help budget or save. You can call anytime (and speak to a real person). Overdraft Automatic £250 fee-free overdraft. Signup offers No minimum balance - open your account with just £1. Consumerdeals cannot be held responsible for any comments posted to this site or our discussion forum. Please refer to our disclaimer for information on site content and removal of inaccurate or inappropriate content.